“The time when kids leave school to come home is the worst time of the day when the heat is most unbearable." To help its students counter the sweltering heat, Sanskriti School in Pune has come up with a novel solution. They have covered the buses with dry grass which gets watered just before students are picked up from their homes. This has led to cooling down of the bus temperature and made the journey from home to school bearable for the students. Not only this, the school has also started giving ORS (oral rehydration solution) to students every afternoon to keep them hydrated. These steps have been greatly appreciated by the parents. As the mercury touches 43 in the city, such steps are not only welcome but also essential for all the schools. “The time when kids leave school to come home is the worst time of the day when the heat is most unbearable. Not every school can have A/C buses and some children stay really far away from school. After a taxing day at school which includes playtime and running around, the ride home in this weather can get suffocating, especially for the younger kids. That’s why I was pleasantly surprised when I saw the buses covered with wet grass. And it’s not the only step taken by the school,” says one parent, as quoted by The Indian Express. 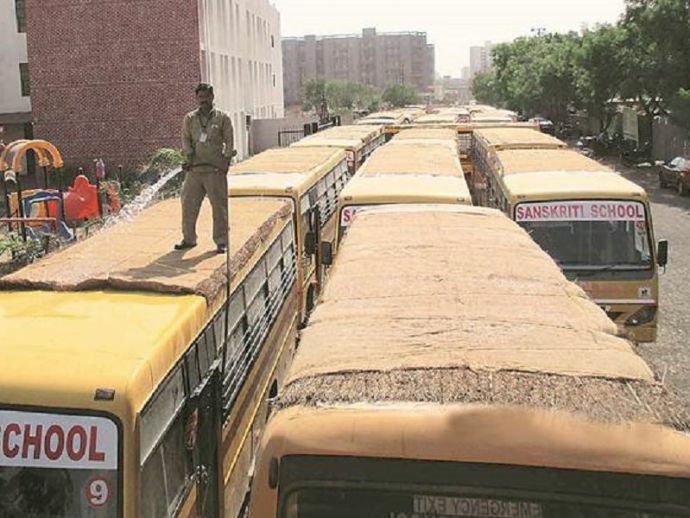 The dry grass, khus fibre, was brought from Delhi for about Rs 10-12 lakh and for ORS, the school authorities spend around Rs 4,000 per day. The school bore all the cost for this initiative, a fact worth mentioning. We just hope other schools in the city follow this example.